Is Brazil Ready To Step On The World Stage? : Parallels All Things Considered host Melissa Block is in Brazil, reporting on the rise of the Brazilian middle class and the country's preparations for the World Cup and Olympics. Is Brazil Ready To Step On The World Stage? 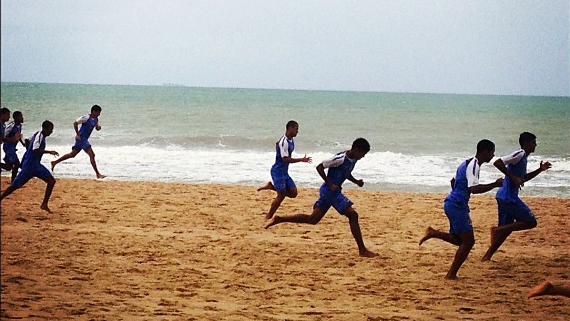 An under-20 soccer team trains on the beach in Recife, Brazil. As Brazil readies to host next year's World Cup and the 2016 Summer Olympics, All Things Considered host Melissa Block is in the country reporting on how it's all coming together. Although soccer is a major enterprise in Brazil, it hasn't hosted the World Cup since 1950, when it suffered a major defeat to Uruguay. It's become known as the "fateful final" and left a painful, embarrassing legacy. Hosting the world's biggest soccer event should be a huge moment for the country, but not everyone is sold on the cost associated with hosting the World Cup and Olympics. Block says many in Brazil's rapidly expanding middle class are angry at the billions of dollars being spent on stadiums and related infrastructure. In addition to soccer, Block will also be looking at stories on racial inequality and the struggle to save endangered golden lion tamarins on her reporting trip. You can listen to her stories all next week on All Things Considered and follow along with her adventures on the Tumblr Considering Brazil.